This is one of the most elegant display sets that you can use for showcasing some of your favorite necklaces, earrings and bracelets. Containing eleven individual pieces, this set enables you to create countless combinations of display configurations for your jewelry. You definitely know how important it is for your jewelry store to have everything well organized, so that you know where to find each accessory, and also to make it easier for your potential customers to admire the beautiful jewelry that you showcase. 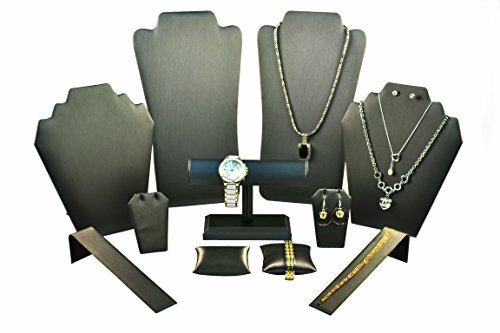 For this purpose, you need this amazing Regal Pak 11 piece set new steel grey jewelry display. This set comprises of eleven various size and shape display items, so that you can easily find the best place for each of your accessory. Whether you want to have them displayed together, to create a unity of your beloved accessories, or you prefer to arrange them in a specific configuration, you can easily do it. These pieces are lightweight, thus you can rearrange them for as many times as you wish. It contains two necklace stands, where you can display one of your favorite necklaces on each of the stands, two display stands where you can display necklaces, earrings, or even sets, a T-bar for your bracelets and watches, two display stands for your earrings, two slide displays for bracelets, and two pillows for your bracelets. Covered in a simple, steel grey material, the eleven displays in this set make your jewelry withstand from the rest, and attract many viewers.